Get ready to glitter in this evening gown. This dress has a modest neckline with beaded choker and fine sequins stream throughout. You�ll shine from every angle. 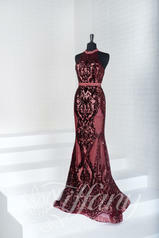 This gown is fitted and moves into a soft, flared shape. This gown finishes with a full-length hem, v-back with center zipper, and sweep train.